…spurred by tariffs and trade tensions, global companies are beginning to shift their supply chains away from China, just as some Trump administration officials had wanted. Figure 1: Trade diversion when home country does not produce. Adapted from Feenstra-Taylor. Suppose pre-trade war, SChina is the relevant supply curve for Chinese imports into the US, as is SThai for imports from Thailand. Q4-Q2 is imports from China, Q2 from Thailand. The imposition of tariffs and the political risk associated with the imposition of further tariffs makes the relevant Chinese supply curve SChina+t. Imports from China falls to Q1-Q3, while imports from Thailand rise to Q3. Consumer surplus shrinks from triangle EDH + triangle HJK to triangle EAF + triangle FCK. 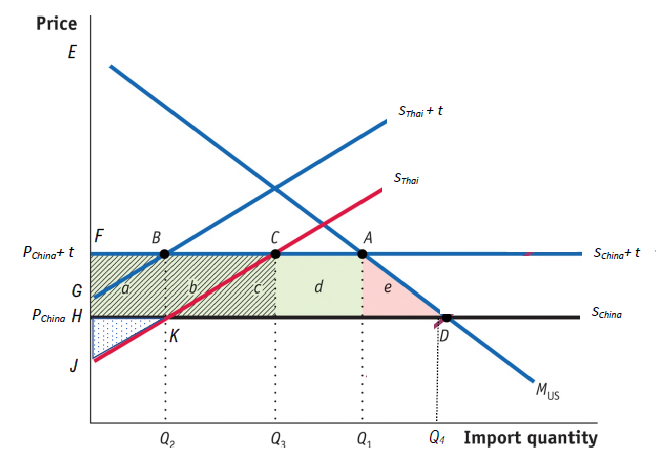 There is a consumption side deadweight loss of area e, and a production side deadweight loss of c. To the extent t represents outright tariffs, then area d is a transfer from consumers to the US government. If t represents the higher price due to restricted supply (if voluntary export restraints then the rents go to foreign exporters). The US is an outright loser in this static/small economy analysis. Notice that the US is still better off with imports from Thailand than in autarky. The preceding analysis has assumed no US production (trade diversion graphs often include domestic production). The article notes some activities have been relocated home to the US, but it’s not apparent that this is the key shifts. In any case, US manufacturing employment and output has faltered in recent months (although an observation or two a trend does not make). 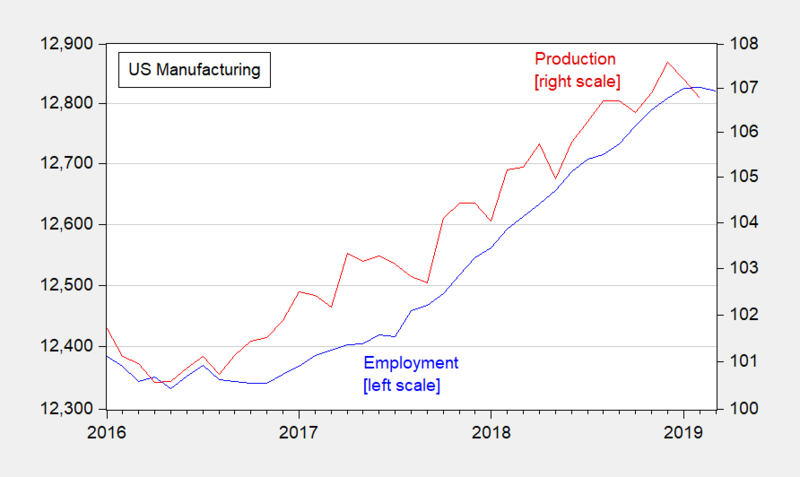 Figure 2: US Manufacturing employment, 000’s (blue, left log scale), and manufacturing production (red, right log scale), both seasonally adjusted. Source: BLS and Federal Reserve via FRED. Remember, an increase in input prices (like steel) will tend to reduce the effective protection received by downstream industries (like automobiles), resulting in job losses exceeding protected sector job gains. This entry was posted on April 6, 2019 by Menzie Chinn. This is an effect of the GVCs that I have to confess had never even occurred to me, but seems blatantly obvious after the fact it is pointed out to you. I had downloaded one of the better books on GVC for free (still haven’t read it yet). It was provided in the under-portion in a Youtube video, if you can imagine that. (Treasures are found in weird places on the internet, and I’m not just talking 4Chan or Wikileaks here) Anyways, I think GVC is at the very crux of the things economists should be studying and monitoring during this trump tariff rubbish. And really in general to get a grip on International trade. And I also think many politicians are absolutely clueless on the importance of GVC and the conceptual framework of GVC. For whatever that’s worth coming from this “Joe six-pack” “Armchair/Wannabe economist”. I have this tormenting and agonizing feeling my tombstone epitaph will be “The man who was good at acquiring books and research papers for free, but only ever read 3 of them in his ENTIRE lifetime”. Come to think of it that’s probably one of the better things they could put on my tombstone. I’ve always wondered what it feels like to be donald “the VSG” trump. I finally did it!!! I finally did it!!!! Shouldn’t that be “to triangle EAF + triangle FBG”? Aaaaaahh, FCK it all anyway. 2slugbaits: Yes, if tariffs are imposed upon Thai imports too. Shouldn’t that be “to triangle EAF + triangle FCJ”? Unless I’m misunderstanding (which is entirely possible) Menzie is stating this part as if the tariffs have yet to be imposed on Thailand. If one goes back to Viner’s seminal article, the entire point is that tariffs were placed on the low cost producer (China) but not on the higher cost producer (Thailand). So yep – you are understanding this. Yea but the Thai manufacturers win big time which is the whole point. Someone at the SEC check out the stock trades made by Wilbur Ross to see which foreign firms he purchased just before this trade war. 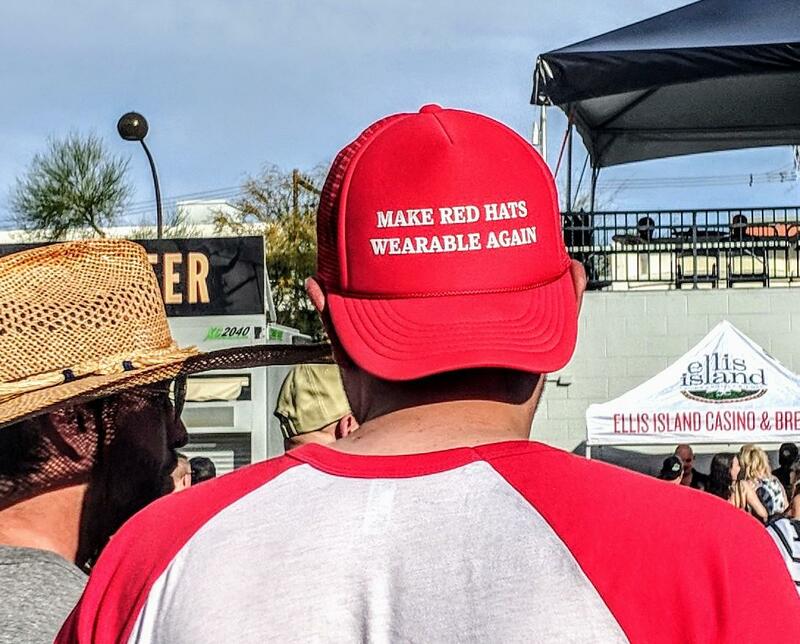 Make America Corrupt Again! Stopping forced technology transfers, forced joint ventures with state owned enterprises, technology theft, and cyber espionage by the Communist Chinese will be a huge victory for the U.S. economy and military. Would Google be a bigger company, with more high-paying jobs, if China didn’t cheat and steal? Future U.S. industries will again dominate under fair competition. Once again Trump sends PeakIrrelevance out with another rant that does not have a thing to do with the post. C’mon Peaky – learn to read! OK Larry – how do you know these four women are lying? Good luck with dealing with the Me Too movement! I would assume India, Vietnam, Thailand, Bangladesh (although they seem to be forever weighed down with flooding issues, somewhat similar to the Philippines) would be low labor-cost countries good to do business with. Cambodia was mentioned in the NYT article. Those southeast Asia countries are a great choice—because as long as those countries surrounding China have not already become a proxy country for Beijing’s power grabs, you’re going to give them more independence and at least a weak tether to America. Certainly India is not a proxy country for Beijing (though Beijing is doing their usual bullying on India territory along the border). Apparently Beijing thinks India is as easy a push-over as Tibet was in 1950. Some countries like Vietnam may never think of America as an ally, but they might appreciate a small hand from American trade as a small respite from being continually shoved around by their “older brother” China. I was just thinking this out, in the “mind of a baby” way that I do. And I was thinking, if we made China the “home country” and soybeans the product instead of “manufacturer’s labor cost in a GVC chain” could we not make quite a similar graph?? Where production is diverted to the “higher unit cost” country of Brazil and then you have a portion of consumer side deadweight loss (to Chinese consumers) when the supply curve shifts to “S-USA +t” ?? I mean obviously there’s about a zillion examples you could give of that—especially if and/or when a trade war broke out in real life. Or because with manufacturing you’re thinking more in terms of GVC supply chain, whereas soybeans would NOT be that type of “GVC” product (Ex: electronic components) where you have other suppliers “downwind”?? Does anyone out there know, where I can find a site that quotes the broad market price of Limes??? I would appreciate it if anyone can pass that along. Seems they have drastically risen in the last month and I was wondering if there is a site, maybe similar to Menzie’s “ino” site or the old Chicago Mercantile Exchange where I can see where limes are trading at broadly?? Answered my own question. Looks like it’s seasonal, price wise the worst time is from roughly the 8th week of the year, to the 24th week of the year. It varies slightly, but that’s basically what you’re looking at price wise, they jack up the price around early-mid March and then it slowly slowly slowly goes back down to normal around late June, then steadily low to roughly March when they jack up the prices again. “A few days after President Donald Trump punted on his vague threat to “close” the U.S.-Mexico border, the White House’s top economic adviser said Sunday that Mexico should still take the President’s threats seriously”. BAHAHAHAHAHA!!! But it gets better! Lord with this moron on her show – how did Margaret Brennan avoid falling on the floor laughing?! Lots more interesting information but this story was from five days ago. I sure hope this avocado crisis subsides!